How much does it cost to make a penny? 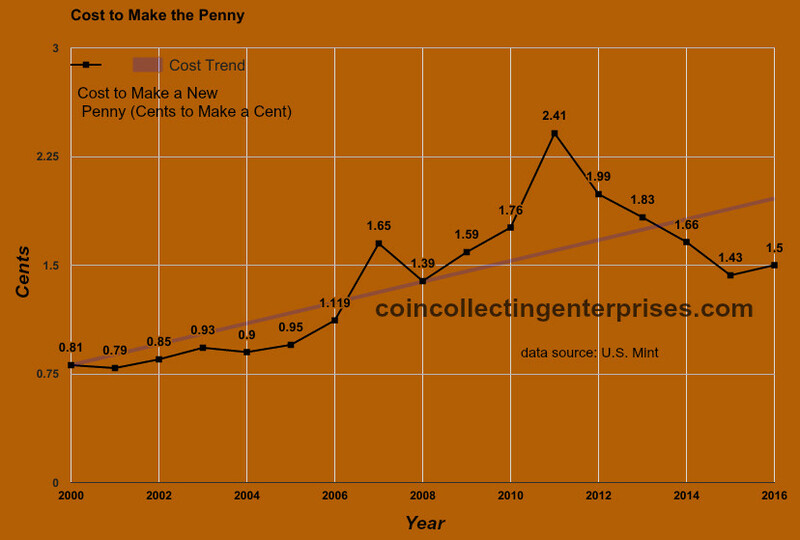 Current cost to make, or mint, the U.S. penny/one-cent coin is 1.50 cents per one cent. This is an increase of 7 cents per coin in penny cost compared to last year, showing there is a steady rise in metal prices impacting coin production. The overall cost of the one-cent penny was 46 million dollars ($46,000,000) for year-end 2016. The below chart shows the change in cost for the coin since the year 2000 to present day. Note the last year states 2016 as the U.S. Mint produces results based upon prior year-end numbers. The cost to produce one cent needs to be under 1 cent to be profitable. Meaning, the cost to produce has been greater than the face value for over ten years or an entire decade. Customers (consumers) buy the coin for face value. Anything over face value is an expense by the United States Mint not covered through the sale price. The U.S. Mint still mints the penny out of 97.5% zinc and 2.5% copper. The coin design is the Lincoln Union Shield cent. The front (obverse) show’s Lincoln’s profile of his face. The rear (reverse) show’s the shield representing the Union of the United States. The U.S. Mint produces them at three main locations. Respectively located in: Philadelphia, Denver, and San Francisco. In conclusion, Canada eliminated its penny in 2012 due to rising costs in metals. The United States may eliminate its penny in the near future if prices continue to rise. When Canada did eliminate its penny, the coin collecting value skyrocketed. Do you plan to hoard pennies before it is eliminated?